The technology behind modern vehicles has changed drastically. Today, you won’t be surprised to find self-driving vehicles, electric vehicles and such other technologically advanced vehicles. If you own an older car, you may want to upgrade it by integrating the latest convenience features. In case you do not upgrade, you will remain stuck with outdated equipment. Luckily, it’s easy to add new technologies to older cars rather than investing in a brand new car. For instance, one major convenience feature in cars today is Bluetooth. 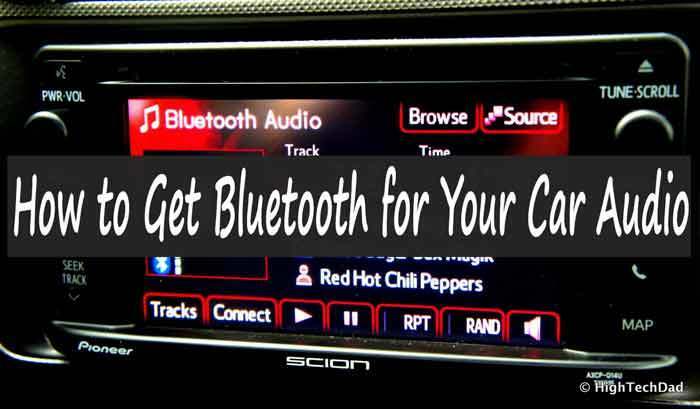 Since Bluetooth is a technology that has been in use for years, it is easy to add it to your car audio. Wondering how to get Bluetooth for your car audio? Worry no more. Read on for more details on how you can add Bluetooth to your older car. Bluetooth technology allows two devices to communicate wirelessly. Modern car audio systems come with Bluetooth functionality that allows streaming audio from your mobile device to the stereo system of your car. For instance, by adding Bluetooth functionality in your car, it will be easier to stream audio wirelessly from a smartphone, portable music player, tablet, or even a laptop. You’ll also be able to answer calls hands free. With that said, are you planning to get Bluetooth for your car audio? Well, there’re three main ways of getting Bluetooth functionality for your car audio. A car-specific Bluetooth adapter is a gadget that creates a Bluetooth connection in your car’s factory stereo. If you like the appearance of the audio system that came with your car, and you don’t mind having some extra wiring done, then you can go with this option. Installation usually involves removing the factory audio system that came with your vehicle, connecting the cables that come with the Bluetooth adapter and routing a wired microphone within the head unit. This way, you won’t really need to replace the head compartment of your vehicle’s stereo system. The adapters usually come with a microphone for responding to calls without holding your phone. Caller information usually appears on the display of the stereo system. This way, you can easily answer and place calls using the controls of your stereo and also stream music wirelessly from your smartphone to your car’s stereo. Installation time and difficulty typically depends on the manufacturer, but most systems come with simple car-specific wiring and adapter add on. The best part about adding a car-specific adapter is the fact that it is specially designed for the type of your car. This way, you will achieve the best audio quality and installation guidelines that are specifically meant for your car. If pulling cables apart is not your thing, then how would you get Bluetooth for your car audio? It’s quite simple. All you should do is to install a universal Bluetooth add on to your vehicle. Universal Bluetooth kits are standalone Bluetooth units that work in almost any car. They come with an in-built speaker and microphone. The speaker works as a wireless method of listening to music and calls while the microphone enables you to respond to calls handsfree. Most of these kits can be mounted anywhere you would want using tape or a suction cup. Universal kits come with multiple benefits and an equal measure of shortcomings. Luckily, most universal adapters are portable such that you can move them easily from one car to another. Thus, if you swap cars often and you wouldn’t want to invest in multiple units, then you can always carry the kit with you. The main downside of universal kits is that they cannot be connected into the stereo that came with your car, thus you’ll be unable to connect your smartphone’s music applications to the car stereo. Nevertheless, there’re some universal adapters you can connect to the head compartment of your existing car audio that will allow you to add audio streaming capabilities to your car’s stereo. However, the installation process is more complicated. If you’re unable to get a car-specific bluetooth adapter or you wouldn’t fancy the idea of having universal kits hanging around your dashboard, then how would you get Bluetooth for your car audio? Well, you still have another great option. You can add an aftermarket audio unit with Bluetooth functionalities. This will require you to replace your car’s stereo head compartment with an aftermarket audio unit. This option is great for individuals who desire to add a Bluetooth-capable car music system that has multiple functionalities. However, the installation process is a bit more complex than the previously mentioned options. You should also be ready to accept the appearance of an aftermarket audio system. Most aftermarket stereos have user-friendly installation guidelines. With the required tools, some hours and patience, you can be able to replace an older car audio system with a new aftermarket system with Bluetooth functionalities. There’re many types of aftermarket car stereos to choose from. Luckily, most of these replacements are affordable and most modern brands come with Bluetooth functionalities for calling and music streaming. You can also find aftermarket audio units that support complete smartphone integration, including making voice commands to control your car stereo system and capabilities of reading messages out loud. Although such advanced Bluetooth functionalities may come at an extra cost than standard aftermarket units, you’ll be able to enjoy more control over your car audio while keeping your eyes focused on the road while driving. Luckily, there’re many types of aftermarket bluetooth adapters such that you will surely find a system that will closely match the factory system in terms of design, color and size. Upon going through these tips, you can see it’s easy to get Bluetooth for your car audio. Bluetooth technology makes it less risky to use your vehicle’s stereo while driving. You will also be able to answer calls hands free, making it safer to communicate while driving. Actually, most local authorities only allow for handsfree calling when driving. As uses for Bluetooth technology continue expanding, its uses in motor vehicles will also increase.